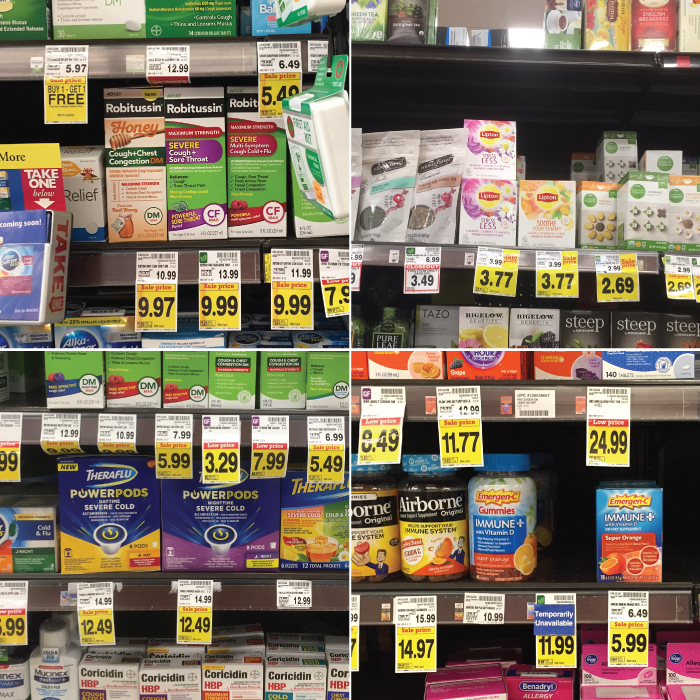 This shop has been compensated by Collective Bias, Inc., Abreva, Emergen-C, Lipton, Robitussin and Theraflu. This past year, I’ve talked a lot about my mental health, but I’ve failed to mention much about my physical health, which has also left much to be desired. I consider myself a “bad” sick person – granted, I would love to meet a “good” one – but I’m bad at being sick simply because I don’t slow down, even when I know I need to. As a small business owner, days off don’t exist, which means sick days don’t either (or at least they didn’t used to). That said, I’ve learned a lot about knowing when to take a break and slow down, and I strive to always keep a “sick kit” in the house for when illness strikes, and you know it will! 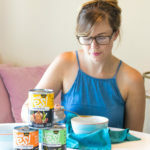 That’s why I’ve partnered with Kroger to share why I keep my cupboards stocked with Abreva, Lipton, Robitussin and Theraflu products and how I find time to take breaks to help myself recover faster. This time of year, you know sickness is imminent! 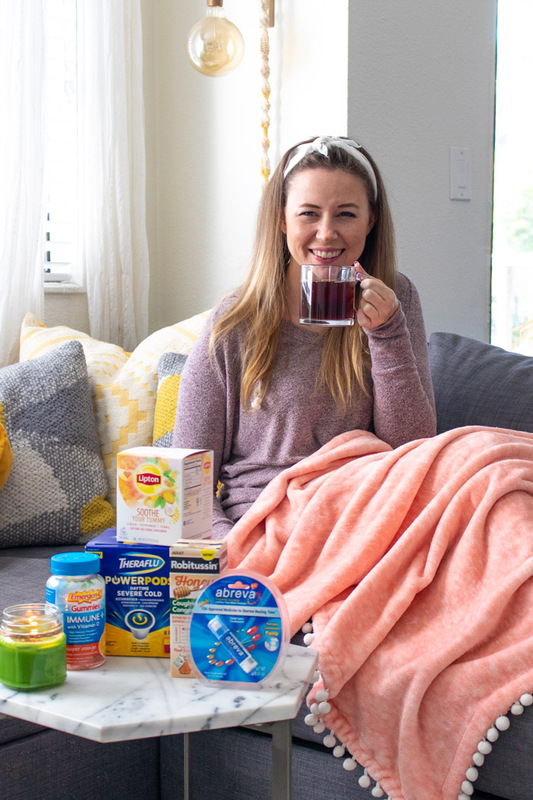 Having a homemade sick kit stocked with must-have cold and flu relief products are a must, so you don’t have to make a last-minute trip to the store when you’re already feeling sick. 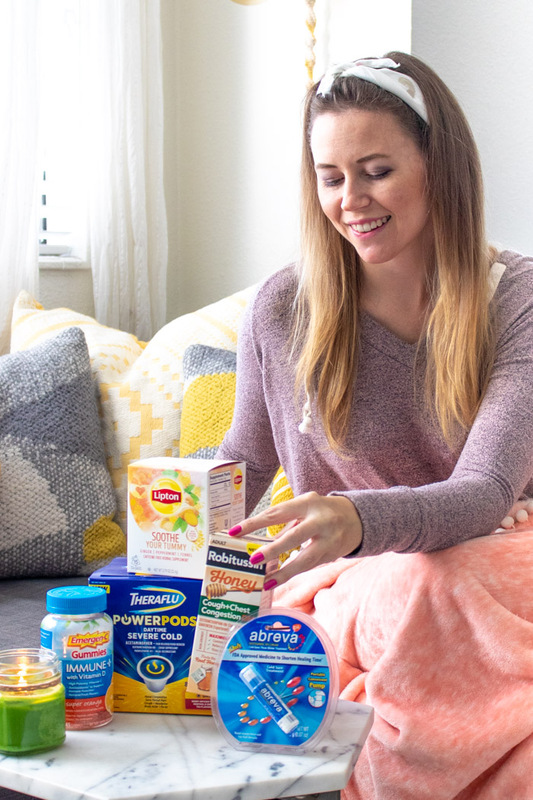 I know that when I’m sick, the last thing I want to do is leave the house, so having your go-to sick day products always stocked is incredibly helpful for yourself and the rest of your family. Lipton Soothe Your Tummy Tea (or Lipton Bedtime Bliss Tea)* to help soothe an upset stomach with a blend of botanicals and essential oils. Plus, it tastes great and you can enjoy it even when you’re not feeling sick! Robitussin® Maximum Strength Honey Cough & Chest Congestion DM to fight your cough and ease your symptoms quickly. This liquid-strength medicine soothes on contact and contains the real honey you want with the powerful cold relief you need! 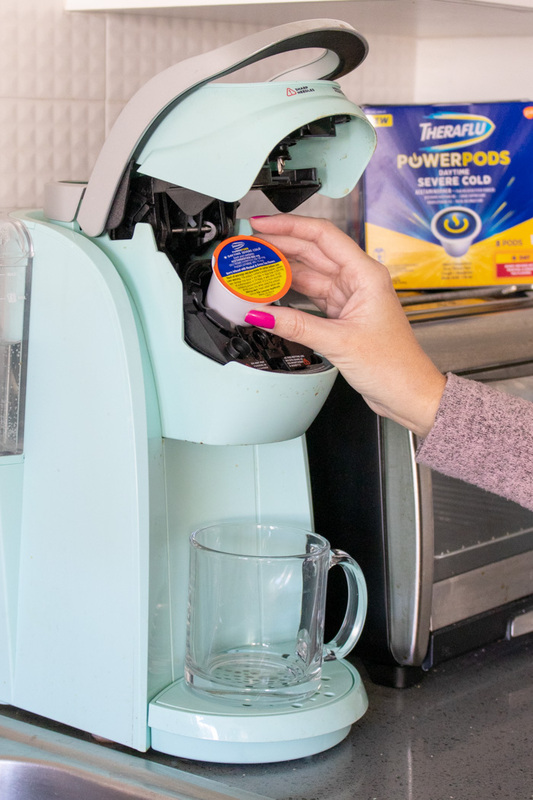 Theraflu Power Pods Daytime Severe Cold provides powerful relief without a prescription to help fight cold or flu symptoms by fitting right into your single-serve coffee maker! Each fast-relieving pod eases most cold symptoms and can be brewed in your coffee maker easily! Abreva® Pump Cold Sore and Fever Blister Treatment to help heal at the first sign of a cold sore so that it clears up quickly. Nothing heals your cold sore faster than Abreva! 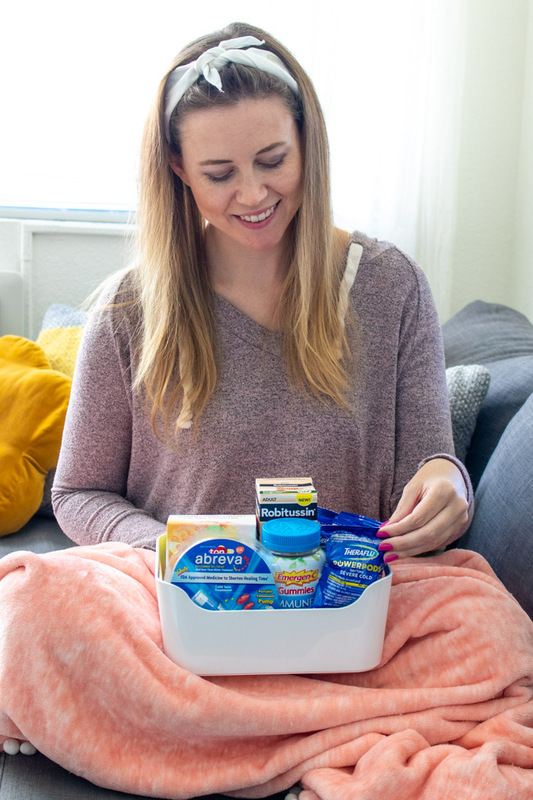 Add all of your favorites to your sick kit in a small box or container, including some tissues or other products that help you get through a sick day! Everyone has trouble slowing down sometimes. Business owners, parents, students or literally anyone with a job may not have the luxury of taking a day off, but the truth is, we all have days when we NEED it. Otherwise, your illness could get worse! It’s taken me years to accept that when I feel sick, I need to stop and relax, even just for an hour, and even when it means I’m multitasking. Take a 30-minute nap, relax in a hot bath, do your computer work from the couch, or try anything else you can. Having a sick kit helps! 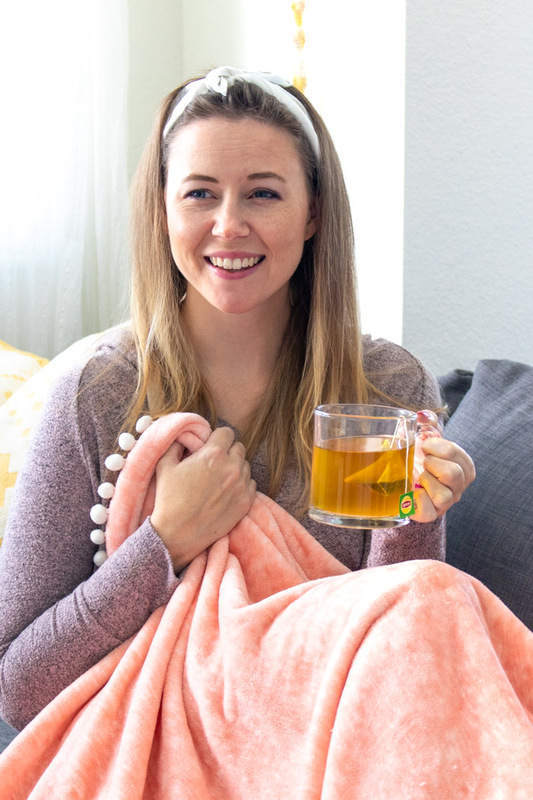 For example, when I wasn’t feeling well recently, I brewed a hot cup of Lipton Soothe Your Tummy Tea with botanicals like ginger and peppermint that make it both delicious and soothing. I enjoyed my tea and watched a TV show while scrolling through Instagram (technically a “work” activity for me) and then did a little more work from the couch without overexerting myself. In life, it’s all about balance! Take time when you need it, and when you do need them, you’ll have products at the ready to ease your cold and flu symptoms in your sick kit! 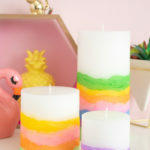 Thank you for supporting the brands that keep Club Crafted sharing! 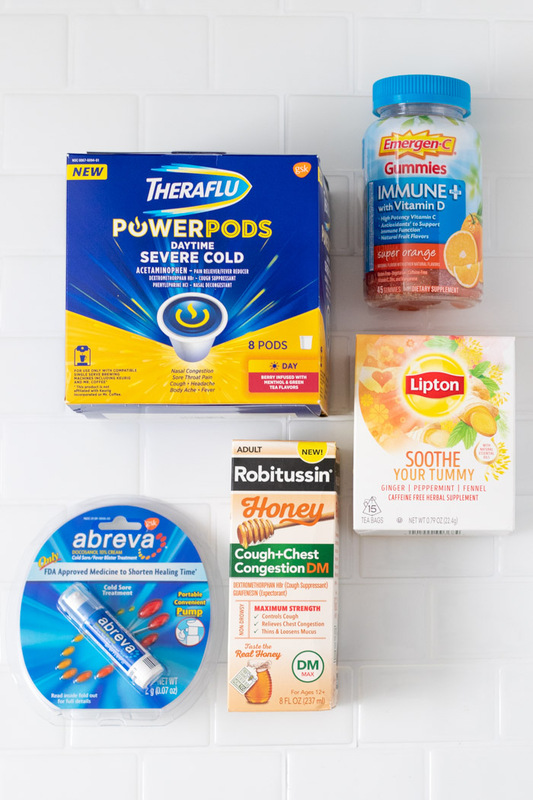 Disclaimer: Theraflu-(c) 2019 the GSK group of companies or its licensor. Theraflu is for use in adults 12 years and older. Use all products only as directed. Read label and follow directions. Abreva, Emergen-C, Robitussin – Use only as directed. Read label and follow directions.